The EI-1040 is a dual programmable gain instrumentation amplifier with a precision reference output for bridge excitation. Gains are digitally selected at values ​​of 1, 10, 100, and 1000. Four TTL or CMOS-compatible address lines individually select the amplifier gains. Applications of this device are for signal conditioning and amplification of low-level signals zoals thermocouples and transducers. This device is alsoused in conditioning signals to be TRANSMITTED over a long distance to single ended receivers. 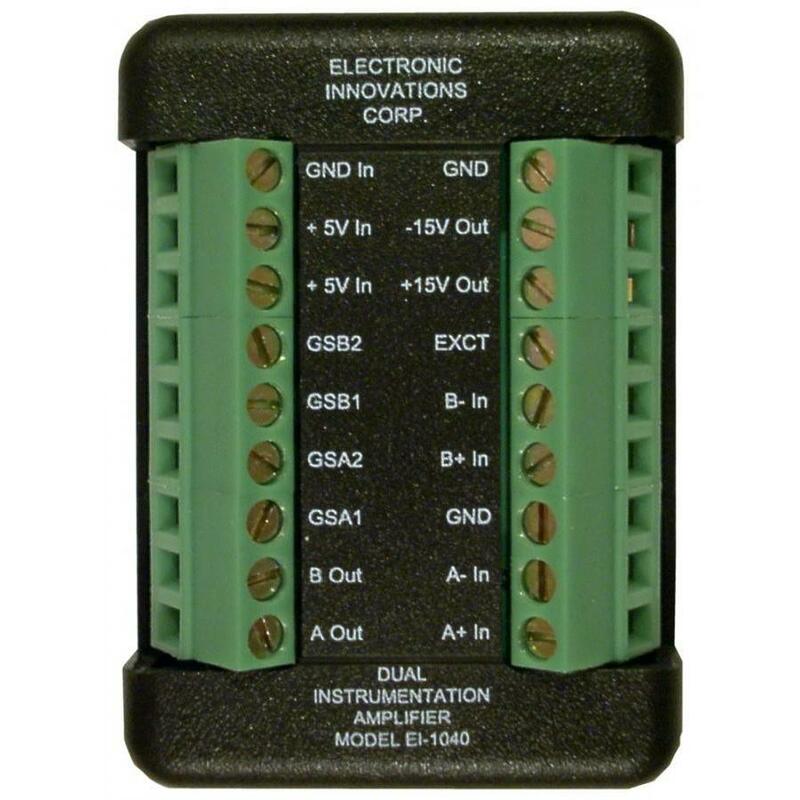 The EI-1040 requires +5 volts DC at a nominal 0.1 amp. An internal DC to DC converter supplies an output of +15 and -15 volts nominal. The EI-1040 Consists of two Burr-Brown / TI PGA204 amplifiers and one DCP010515DPB DC to DC converter. 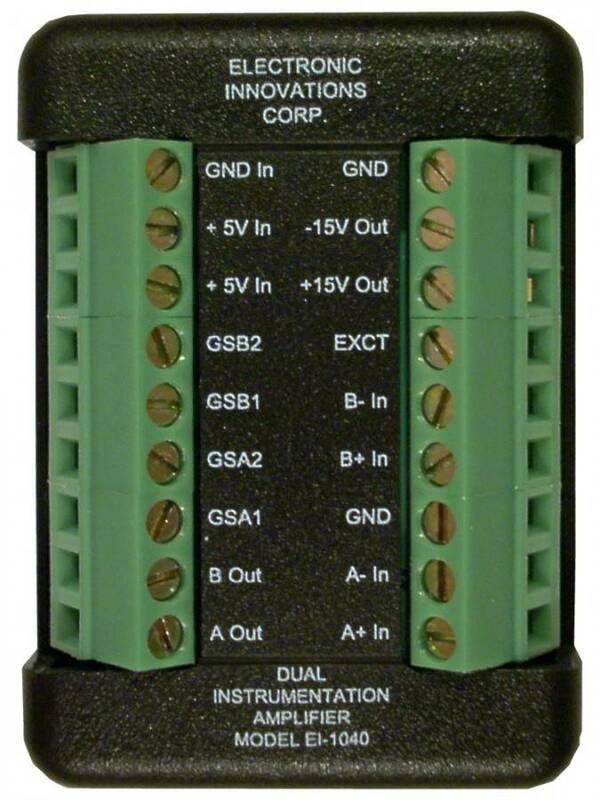 A 4096 volt reference is provided for connection to a bridge or other device that demand excitation. 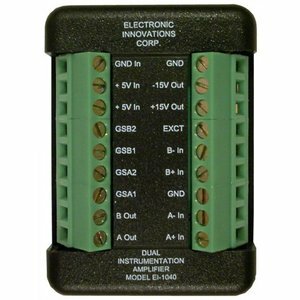 The maximum allowable current draw from this source is 5 ma. Combinations or gain can be selected so That For example one amplifier can have a gain of 10 and the other have a gain or 100. The voltage level of a 0. 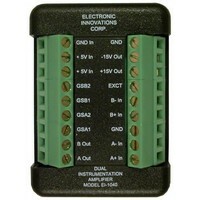 Typically ground and the level of a 1 is 2 volts above the digital ground ( PG204A see the spec sheet for exact levels). It Should Be Noted That When The EI-1040 / Labjack is powered from limited power sources zoals notebook computers, bus-powered hubs, etc., there May not be enough current to supply both devices. A message from the computer shouldering tell the user whether this condition.